I like the holster company in a hole. I ordered the roughneck first and didn't like the way it set on my waist. So I called the company and they set it up for me to get a high-ride holster which it fits and feels excelent, when I where it bough IWB and OWB. the only draw back is it does stickout just a little. all in all it is a very good, no a excellent holster! Finally got to open my package been on vacation. The holster is beautiful and very well made. Fits my m&p shield perfect and the magnetic tension is awesome. Was able to wear with basketball shorts all day. This is a top quality holster that is very well made. The thing I love is that the holster can be easily positioned due to the magnetic clip system, but this same magnetic system holds the weapon very securely on your belt. The retention of the firearm is also due to the magnets, and this is also very effective. I have a J frame that is very happy in this holster. First ordered the original and the grip would not let the holster fit all he way down in my pants and the magnets clicked together right about mid belt. Changed out to the high ride. It does not fit like in the picture with the grip up above the pant line. The grip fits down even but this one allows the part that flips over the belt line to fit like it should. Could be worn without a belt if pants would support the weight. The leather is really nice and soft against the skin but it allows the texture of the grip to rub. If the sweat guard covered the whole gun I'd give it five stars. Delivered in 3 days after order, perfect fit high quality product. I couldn’t be happier. Was really Impressed with the quality. It fits like a glove. 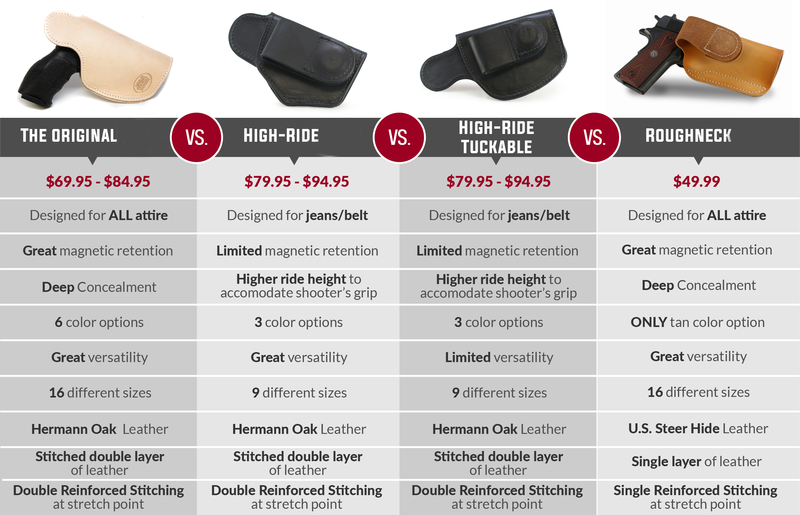 The easy on and off is what makes this holster stand out. Awesome quality, great stitch work, would love to see it a little more customized to my gun when it comes to getting a good grip on my gun before drawing (slide protection a little too large), but other than that works and fits perfectly. Love the way it fits mt weapon, snug as a bug in a rug. Excellent craftsmanship.